On May the 16th, over 100 000 concurrent players were playing War Thunder on PC and Mac. That’s a great indicator of the high appreciation for the game and we would like to thank our players for their loyalty and interest. 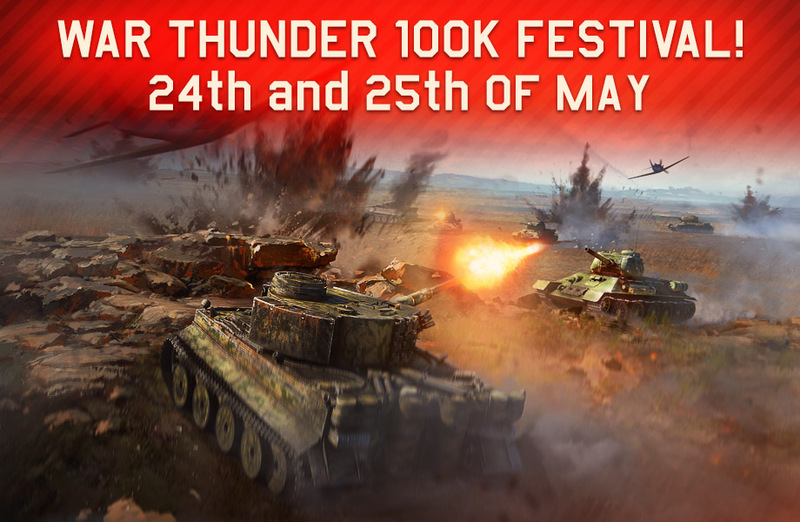 From May 24th 06:00 GMT to May 26th 06:00 GMT we are running the “War Thunder 100K” Festival. Numerous discounts and rewards for PC and Mac Players! *kills will be counted for aircraft and tanks separately. By killing 100 (Arcade) | 50 (Realistic) | 25 (Simulator) enemy players in aircraft you will earn 100 Golden Eagles up to a total of 500 Golden Eagles. By killing 100 (Arcade/Realistic/Simulator) enemy players in tanks you will earn up to 100 Golden Eagles up to a total of 500 Golden Eagles as well. In total, you can so earn up to 1.000 Golden Eagles! Join the War Thunder Festival and see you on the battlefield!